The Training Manager Competency Model™ is the foundation of our Continuing Professional Development programs, providing current and future learning leaders with specific insight into the core responsibilities of a training manager and the competencies needed to perform them successfully. The model grew out of Training Industry’s Great Training Organizations research, launched in 2008 and updated annually since, to identify and explore the traits of high-performing training organizations. The model was developed and validated through job analytic research using a sample of training managers and learning and development (L&D) professionals who work directly with training managers. 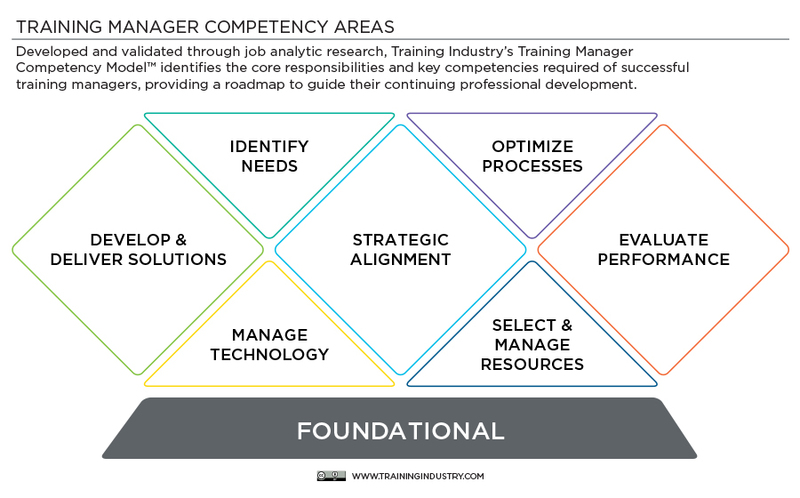 The Training Manager Competency Model™ identifies the seven core responsibilities and foundational leadership competencies which are essential to successful training management. Within each core responsibility are the competencies that the training manager must have to successfully perform the responsibility. Training Industry’s Continuing Professional Development program. Training managers are lifelong learners who are continually improving their skills. By defining the competencies needed to be successful as a training manager, The Training Manager Competency Model™ provides strategic guidance on where to focus your learning. You can use our competency assessment to reflect on your skill level in each area and use the full model to create a plan to target opportunities for improvement and areas of strength to maintain. You can also use both the model and assessment to develop your training team and prepare future leaders in your company, a key component of training organization success. Training Industry is committed to developing learning leaders. We offer a full catalog of educational and professional development opportunities specifically designed to develop these key competencies of a training manager, including the CPTM program, certificates, master classes and events. Contact us or download the Training Manager Competency Model™ flier to identify your competency needs .